It's said that Ensenada, Mexico—one of Mexico's busiest ports—is built around a bar. Although that's not true (fishing and wineries remain its economic mainstays), Hussong's Cantina has enticed revelers to Ensenada since 1892—a date that's easy to believe once visitors see the legendary watering hole's clapboard exterior and scarred wooden floors covered in sawdust. Most tourist dollars are spent by U.S. partygoers who drive south or arrive on cruise ships out of Southern California. 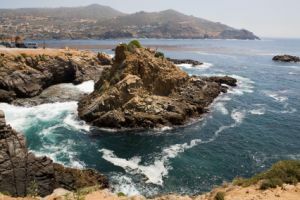 Another of Ensenada's attractions is the low-key and truly Mexican flavor of its reasonably priced restaurants, shops and hotels—all only 65 mi/105 km south of the U.S.-Mexico border. These are rapidly succumbing to mass tourism and all that it entails, but for the moment they are wonderful enclaves of culture and cuisine, and in a much safer setting than most of the border towns offer. Visitors soon find, however, that Ensenada isn't really a beach resort: The closest beach is a 15-minute drive away, and the most important occupant of the waterfront boulevard is a bustling fish market. But while Ensenada has neither the beachfront boardwalk of Puerto Vallarta nor Mazatlan's "Golden Zone" of beaches and bars, it does boast an earthy attraction and friendly people in an authentic Mexican environment. The lack of palm-lined coves and colonial architecture doesn't keep tourists away. Visitors to Ensenada can visit a cantina or sidewalk cafe and stroll through the market and adjoining seafood eateries. Tourists browse along the main shopping district, Avenida Lopez Mateos, with its sidewalks, refurbished storefronts and ornate streetlamps. Visitors can also enjoy good wine from gold-green Guadalupe Valley outside the city. Ensenada serves as the gateway to the fabled Baja Peninsula and is considered one of the best sportfishing ports anywhere along the Pacific.